Estee Lauder have a new fragrance offering that has hit counters this week, and I think it’s going to be a big one. 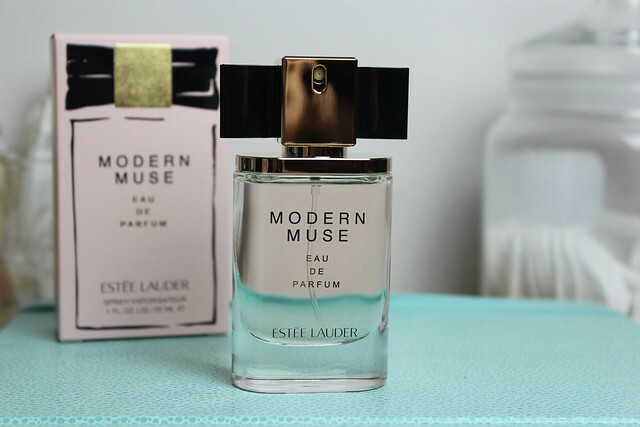 It’s called ‘Modern Muse’ and is described as a ‘lush woody floral’ – with a combination of key notes of ‘Sparkling Jasmine’ and ‘Sleek Wood’ that is to ‘reflect the duality of the modern woman’. I like the whole idea of that contrast together – both in terms of it representing women and in terms of blended in a fragrance. I think it’s true that women can be different things in different parts of their lives – at work I am one person, at home and blogging life another side of me comes out. So I like this idea and think it’s the perfect way to capture the concept of a modern muse. The face of the new fragrances is Arizona Muse – the name apparently just being a lucky coincidence! But she’s meant to represent the idea of the modern woman who’s ‘smile inspires’ and is an ‘independent spirit’ – in the ad the walks into a busy room and seems to draw all eyes on her whilst looking like she hasn’t a care in the world. Not going to lie, who doesn’t want to be that girl?! I’ve always wanted to be that girl who is caught laughing in photos and manages to look glowing and happy…yet I always seem to be the one who looks like they’re guffawing or just awkward. That’s a total aside – back to Modern Muse – the blush pink and navy colours of the perfume and the add are gorgeous, the bottle is pretty, with the classy, rather than overtly girly bow on the top of the bottle (a nod to the history of the brand and the first fragrance – Youth Dew) – although I keep trying to take the non-existent lid off before using it. The fragrance itself is exactly as described – a lush woody floral. The jasmine is subtle in my opinion with the woody notes really toning it down. Personally I really like it and love the overall dry-down as it does manage to be feminine and lovely without being overpoweringly fluffy floral. It feels like a younger version of a grown up fragrance – if that makes sense. Grown up, but not quite as grown up as the Chanel No5’s of the world. I’ve been wearing this daily for the last week or so and really love it. I think it’s a classic in the making. Ever since ive got my job in the perfume shop i’ve been seeing perfume reviews on everyones blogs!